On September 18, these students also visited us as part of their “comprehensive learning time” class. They toured the Conservation Science Section, the Restoration Studio (lacquer, paper, metal) of the Center for Conservation Science and Restoration Techniques, and the Japan Center for International Cooperation in Conservation on the third floor. Those in charge of each facility provided explanations and answered questions. On September 29, this group visited us as part of their inspection of organizations equipped with facilities related to cultural assets. After inspecting the Tokyo National Museum, they toured the Restoration Materials, Conservation and Biological Science Sections of the Center for Conservation Science and Restoration Techniques on the third floor, as well as the Kuroda Memorial Hall, to learn about the surveys and studies conducted by the National Research Institute for Cultural Properties, Tokyo. Those in charge of each facility provided explanations and answered questions. 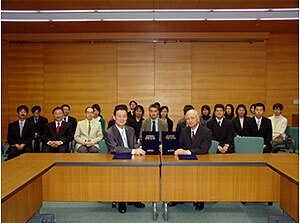 Director Erdenebat (left) and Director ISHIZAKI shaking hands with smiles after signing the agreement. 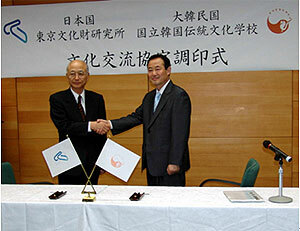 On September 9, 2008, an agreement for cooperation in protecting the national heritage was signed by between the National Research Institute for Cultural Properties, Tokyo, and the Culture and Fine Arts Bureau of Ministry of Education, Culture and Science, Mongolia. The agreement covers such activities as the implementation of joint business, research and development cooperation, fostering human resources and implementation of workshops, focusing on protecting the national heritage. While respecting the positions of both organizations, the agreement emphasizes cooperation in protection of both tangible and intangible cultural heritage. Mr. SUZUKI Norio, the Director of our Institute, visited the Culture and Fine Arts Bureau of the Ministry of Education, Culture and Science in Ulan Bator, and signed the agreement together with Mr. Erdenebat, Director of the Culture and Fine Arts Bureau, Mongolia. Mr. SHIMIZU, the Director of Japan Center for International Cooperation in Conservation, Mr. MIYATA, the Director of Department of Intangible Cultural Heritage, and several other members of our Institute also took place in the signature occasion. Following the signing of the agreement, both parties also signed a memorandum on fostering human resources in protection of cultural heritage, according to the clauses of the agreement. With these agreements, cooperation between our two nations in protection of our tangible and intangible cultural heritage is highly expected. On June 13, 6 members of the Art Research Institute of Shanghai University visited the Institute as part of the investigation related to Western-style paintings in modern China and the investigation of Chinese Buddhist art. Persons in charge of these themes at the Institute spoke to them and answered their questions. 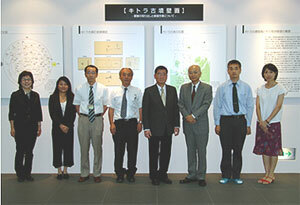 On June 12, the director and 3 members of the Planning Division of the Science and Technology Policy Bureau at the Ministry of Education, Culture, Sports, Science and Technology visited the Institute as part of a preliminary inspection of organizations related to cultural properties in preparation for drafting a plan to establish a “digital museum,” a project promoted by the Agency. After inspecting the Tokyo National Museum, they visited the Analytical Science Section of the Center for Conservation Science and Restoration Techniques on the 5th floor, Restoration Studios of the same Center on the 3rd floor and the Kuroda Memorial Hall. Persons in charge provided them with explanations of the investigations and research conduced by the Institute and answered their questions. 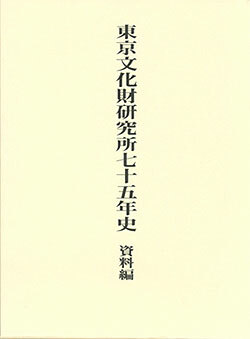 75 Years of the National Research Institute for Cultural Properties, Tokyo – Archives, a record of the 75 years of the Institute supported by materials dating from the founding of the Institute’s predecessor, The Institute of Art Research, in 1935 to the present (2005), was published at the end of March. In this publication are materials that provide information on the history of research in various disciplines dealt with at the Institute. They include: documents collected during the years of The Institute of Art Research, such as an inventory of pre-World War II investigation of art objects, inventory of images of Western art collected by Yashiro Yukio, the Director General of the Institute in its early years, and a list of photographs taken by Wada Arata, Odaka Sennosuke and other former members of the Institute in their study of the arts of India and West Asia; a list of research topics, seminars and lectures in the years following the time that the Institute became a comprehensive research organization in matters related to cultural properties, including fields of conservation science and intangible cultural properties; and a comprehensive list of articles in the periodicals published by various departments at the Institute – namely, The Bijutsu Kenkyu (The Journal of Art Studies), Science for Conservation and Geino no Kagaku (literally, science of performing arts). The Archives has been published for the general public from Chuo Koron Bijutsu Shuppan with the same title. 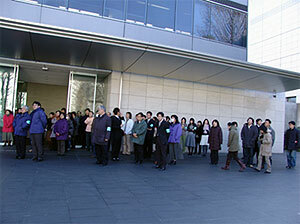 A fire drill was held at the Institute from 10:30 a.m. on January 25. Fire was assumed to have started from the hot-water supply room on the third floor of the building. Many members of the Institute who were working on that day participated in carrying out initial extinction, giving alarm, evacuating from the building and providing first-aid, led by the self-fire brigade composed of the staff of the Institute. At 10:30 a.m., the fire alarm installed in the Institute rang and an announcement was made asking everyone to evacuate. Immediately, the self-fire brigade and the person who first found the fire started the initial extinction (simulation) using fire extinguishers and notified the fire department at 119 (simulation). 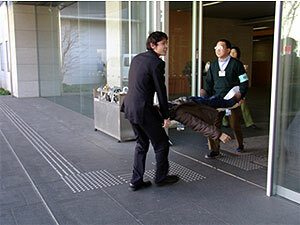 They also guided the members of the Institute to evacuate outside the building. In the meantime, fire-fighting headquarters and a first-aid station were established. Members of the self-fire brigade evacuated a staff who had inhaled smoke and was not able to escape with the others. They also carried out cultural properties that were in the building (simulation). 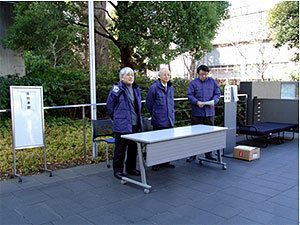 After the fire drill, Director General Suzuki thanked everyone for participating and commented on the importance of Cultural Properties Fire Prevention Day. He also pointed out the necessity for raising awareness about fire prevention. 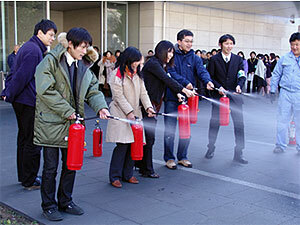 In the drill for fighting fire with a fire extinguisher, after learning about the types of extinguishers and their use, members of the Institute discharged water while shouting “Fire!” The Institute holds a fire drill every year on January 26 as an event related to the Cultural Properties Fire Prevention Day. 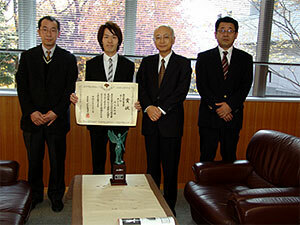 Ishimaru Shinya of the Accounting Section, Department of Management received the Governor of Tokyo Award in the Workers’ Art Exhibition (section on calligraphy) from the Governor of Tokyo on December 2 and reported this to Director General Suzuki. After congratulating Ishimaru, Director General Suzuki and Ishimaru talked about his work and various topics related to his creative activities. This art exhibition, popularly known as Kinbiten, provides an opportunity for people working in Tokyo to present the results of their creative activities. It is an exhibition with a history of 60 years. Ishimaru has been strongly attracted to calligraphy from his childhood and studied in the Calligraphy Course of Daito Bunka University. Then he went on to graduate school to pursue further study in this field at the Department of Calligraphy, Faculty of Literature of the University and has produced scholarly achievements as well. Presently, he is a member of 2 calligraphy associations, The Yomiuri Shoho-kai and Ranjukai, and is engaged in creative activities in the limited free time he has from his work at the Institute. Working at the Institute, which is a base for studies associated with cultural properties, provides Ishimaru with good stimulation and he is doing his best to create better works of calligraphy and to contribute to the development of artistic culture. An offer for donation was made by the Tokyo Arts Dealers’ Association to subsidize projects for the publication of the results of investigation and studies related to cultural properties conducted by the National Research Institute for Cultural Properties, Tokyo. 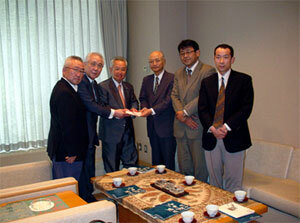 Another offer was also made by the Tokyo Bijutsu Club to subsidize research projects of the Institute. The Tokyo Arts Dealers’ Association has donated 1 million yen each twice a year since the autumn of 2001; this was their 13th donation. The Tokyo Bijutsu Club also donated 1 million yen last autumn and this spring, making the current donation its third one. 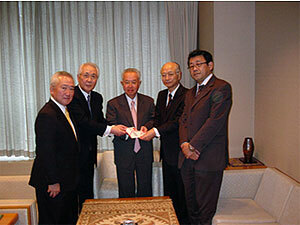 On December 17, Director General Suzuki received the donations at the Tokyo Arts Dealers’ Association in Minato-ku, Tokyo from Director Shimojo Kei’ichi of the Tokyo Arts Dealers’ Association and President Asaki Masakatsu of the Tokyo Bijutsu Club. 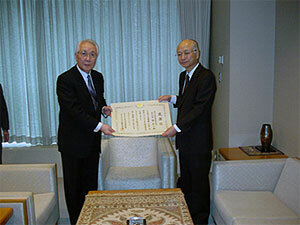 In return, Director General Suzuki presented letters of appreciation to them. The presentations were followed by an informal talk on the conservation of cultural properties and exhibitions of art objects. We are most grateful for their understanding of the Institute’s work and donations and hope to use them for the projects conducted by the Institute. Staff of Gansu Provincial Institute of Cultural Relics and Archaeology and Gansu Provincial Museum, who were in Japan upon invitation from Akita Prefectural Museum, visited the facilities of the National Research Institute for Cultural Properties, Tokyo. After listening to explanations about the Institute from the Director of the Center for Conservation Science and Restoration Techniques, they visited the Analytical Science Section of the Center and looked at the exhibit on the first floor lobby. 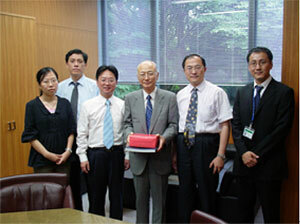 They then met the Director of the Japan Center for International Cooperation in Conservation to exchange opinions. Six students from Taito Junior High School, Okachimachi, Taito-ku visited the Institute on September 21. This visit was a part of their social studies program to learn about various types of work being undertaken in society. They toured the special exhibit on the first floor, the Library, a restoration studio and the Analytical Science Section of the Center for Conservation Science and Restoration Techniques, and the Japan Center for International Cooperation in Conservation. Staff in charge of each section explained the work being done in their respective sections and answered questions from the students. 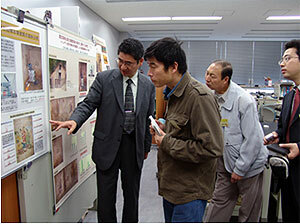 Twelve members of a study group on state-of-the-art technology from the Japan Atomic Industrial Forum, Inc. composed of people from private enterprises, universities and organizations visited the Institute to see the portable x-ray fluorescence apparatus and to study about the conservation of the mural painting of Kitora Tumulus (Genbu). They toured the Analytical Science Section and the special exhibit on the first floor, received explanations from the staff in charge, exchanged opinions and asked questions. Director Arak SUNGHITAKUN of the Fine Arts Department, Ministry of Culture of the Kingdom of Thailand visited the Institute on August 21. He was in Japan from August 20 to 26 upon invitation from the Japan Foundation. He visited the Institute as part of his tour of inspection on activities related to the conservation of cultural properties in Japan. At the Institute, he met with the Director General and then continued to visit the various facilities of the Institute. 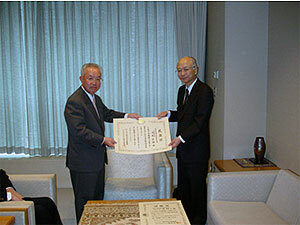 At the Japan Center for International Cooperation in Conservation, he consulted with researchers on such matters as the way for continuing the joint research between Thailand and Japan, which is currently being undertaken, in the future and the preparation for the international conference that is scheduled to be held in Thailand during the next fiscal year. 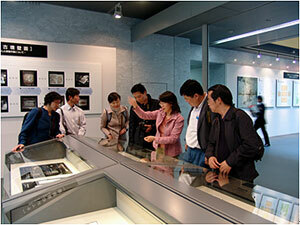 On Friday, July 22 four members of the staff of the Shanghai Museum visited the Institute. 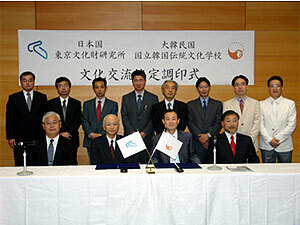 They were in Japan to conduct investigation in relation to the establishment of new laboratories at the Shanghai Museum. After meeting with the Director General, they were led on a tour of the various laboratories within the Institute by him. The National Research Institutes for Cultural Properties in Tokyo and Nara conduct self-evaluation of their work based on their 5-year plan and annual plan. The results of this self-evaluation are reflected on their projects to improve the administration of both Institutes. Self-evaluation for the fiscal year 2006 was recently completed and its report is being printed now. The number of items related to research and projects in 2006 totaled 89: 1 for improving managerial efficiency, 40 for the Institute in Tokyo and 48 for the Institute in Nara. This number is less than that in the previous year since in this period of the 5-year plan research and projects from previous fiscal years were reconsidered, adjusted and integrated. As usual, each of the Departments and Centers of both Institutes prepared its record of performance and self-evaluation form. On May 17 and 24, the Evaluation Committee studied these and presented their comments. From this year all the Departments and Centers at the Institutes presented reports of all their projects to the Committee. Moreover, rather than evaluating project by project, the Committee was asked to present a comprehensive evaluation of the activities of the Institutes as a whole along a list of pre-established evaluation items. Taking into account the evaluation and comments made by the Committee, a summation of the self-evaluation was made. It was confirmed that all the projects had proceeded well and that the initial aims of the projects had been achieved. As for future issues, it was decided that there is a need to actively incorporate funds from outside sources, install large research apparatuses and improve our facilities. The gist of the results of self-evaluation was reported to the Ministry of Education, Culture, Sports, Science and Technology. Offers of donation were made to the Institute from the Tokyo Art Dealers’ Association to fund its projects to publish the results of investigation and studies concerning cultural properties and from the Tokyo Bijutsu Club to fund research projects of the Institute. The Tokyo Art Dealers’ Association has donated 1,000,000 every spring and autumn since the autumn of 2001 and this is the twelfth time. The Tokyo Bijutsu Club donated 1,000,000 last autumn and this is the second donation. On May 28, Director General Suzuki received the donations from Director Shimojo Kei’ichi of the Tokyo Art Dealers’ Association and President Asaki Masakatsu of the Tokyo Bijutsu Club at the Tokyo Art Dealers’ Association in Shimbashi, Minato-ku, Tokyo. The ceremony was followed by an informal meeting to discuss matters related to cultural projects such as the conservation of cultural properties and the exhibition of art objects. We greatly appreciate the understanding that has been shown to us about the projects undertaken by the Institute and wish to make use of these donations for the promotion of our projects.